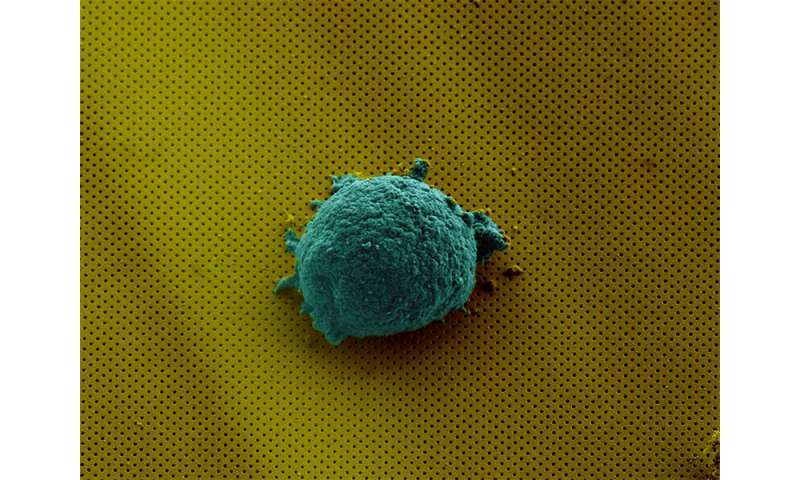 Breakthrough lab-on-a-chip technology that reveals how human cells communicate could lead to new treatments for cancer and autoimmune disorders. Developed by an Australian-Swiss research team, the technology offers researchers unprecedented insights into how individual cells behave—something that scientists are discovering is far more complex than previously thought. The researchers from RMIT University, École polytechnique fédérale de Lausanne (EPFL) and Ludwig Institute for Cancer Research in Lausanne joined forces to build a miniature biosensor that allows scientists to isolate single cells, analyse them in real time and observe their complex signalling behaviour without disturbing their environment. Distinguished Professor Arnan Mitchell, Director of RMIT's MicroNano Research Facility, said single cell analysis held great promise for developing new treatments for diseases but a lack of effective analysis technologies was holding back research in the field. "We know a lot about how groups of cells communicate to fight disease or respond to infections but we still have a lot to learn about individual cells," Mitchell said. "Studies have recently shown that you can take two cells of the same type and give them the same treatment but they will respond very differently. "We don't know enough about the underlying mechanisms to understand why this happens and we don't have the right technologies to help scientists figure it out. "Our solution to this challenge is a complete package—an integrated optofluidic biosensor that can isolate single cells and monitor the chemicals they produce in real-time over at least 12 hours. "It's a powerful new tool that will give us a deeper fundamental understanding of cell communication and behaviour. These insights will open the way to develop radically new methods for diagnosing and treating disease." Human cells communicate that something is wrong in complex and dynamic ways, producing various chemical substances that signal to other cells what they need to do. When an infection is detected, for example, white blood cells will spring into action and release special proteins to fight and eliminate the intruders. Understanding how individual cells interact and communicate is critical to developing new therapies for serious diseases, to better harness the power of the body's own immune system or precisely target defective cells. In a paper published in the high-impact journal Small, the research team demonstrate how the technology can be used to examine the secretion of cytokines from single lymphoma cells. Cytokines are small proteins produced by a broad range of cells to communicate to other cells, and they are known to play an important role in responses to infection, immune disorders, inflammation, sepsis and cancer. The study found the lymphoma cells produced cytokine in different ways, unique to each cell, enabling researchers to determine each cell's "secretion fingerprints". "If we can build up a clear picture of this behaviour, this would help us sort good cells from bad and enable us to one day develop treatments that precisely target just those bad cells," Mitchell said. The biosensor is the latest adaptation of microfluidic lab-on-a-chip technology developed in RMIT's MicroNano Research Facility. 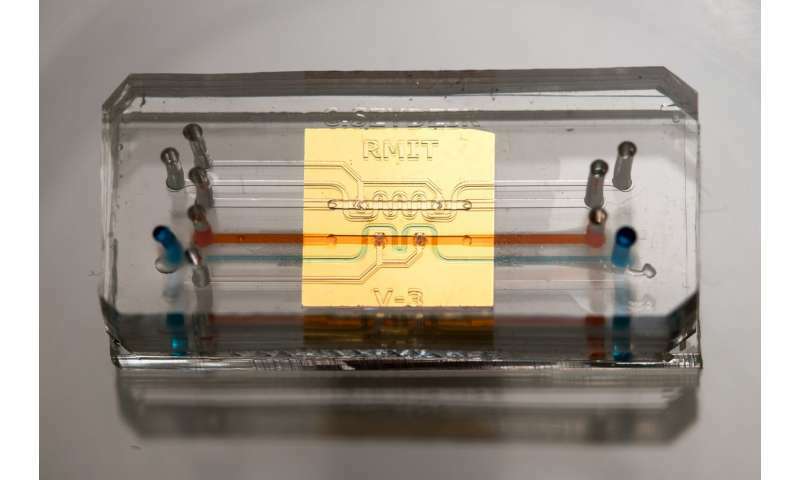 A microfluidic chip contains tiny channels, pumps and processors, enabling precise and flexible manipulation of fluids. Essentially, microfluidics does for fluids what microelectronics does for information—integrating vast quantities of tiny processing elements into a small chip that is portable, fast and can be produced quickly and efficiently. The new cost-effective and scaleable technology is lightweight and portable, combining microfluidics with nanophotonics. Compatible with traditional microscopes, the biosensor is a thin glass slide coated with a gold film, perforated with billions of tiny nanoholes arranged in a specific pattern. These nanoholes transmit a single colour of light, due to an optical phenomena known as the plasmonic effect. 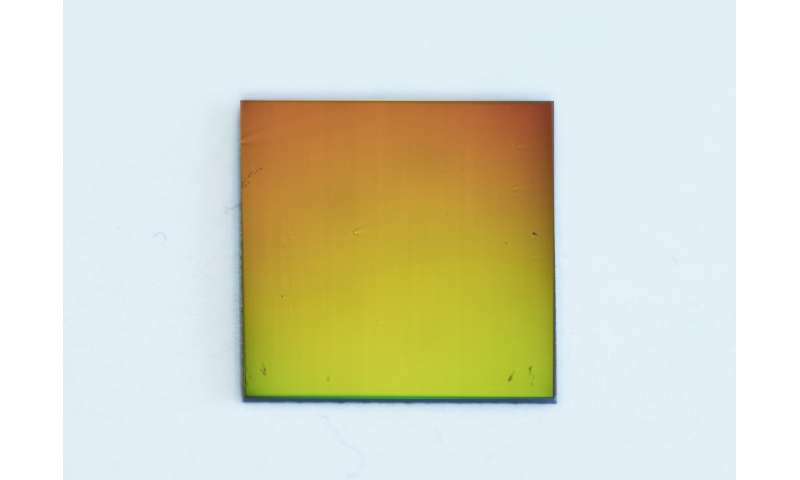 By observing the colour transmitted, researchers can determine the presence of minute quantities of specific chemicals on a slide without any external labels. This detection method enables the continuous monitoring of the chemicals produced from a single cell in real time. The nanophotonic sensor is coupled to a microfluidic integrated circuit with fluid channels about the size of a human hair. The circuit includes valves to isolate the cell and concentrate its secretions, and systems to regulate the temperature and humidity to sustain the cell. The work is a collaboration between the laboratory of Bionanophotonic Systems at EPFL, Switzerland, the Integrated Photonics and Applications Centre in the School of Engineering at RMIT and Ludwig Institute for Cancer Research, Switzerland. RMIT microfluidic chips have been pivotal in enabling research across a range of areas—from water quality monitoring to the development of point-of-care blood tests for suspected heart attacks that could deliver results while a patient is still in an ambulance.